She died 11,500 years ago at the tender age of six weeks in what is now the interior of Alaska. Dubbed “Sunrise Girl-child” by the local indigenous people, the remains of the Ice Age infant—uncovered at an archaeological dig in 2013—contained traces of DNA, allowing scientists to perform a full genomic analysis. Incredibly, this baby girl belonged to a previously unknown population of ancient Native Americans—a discovery that’s changing what we know about the continent’s first people. It’s well established that North America’s first settlers migrated from Siberia into Alaska prior to the end of the last Ice Age via an ancient land bridge known as Beringia (actually, the term “bridge” is a bit of a misnomer as Beringia was a sizeable landmass measuring 620 miles (1,000 km) at its widest extent and encompassing an area as large as the Canadian provinces of British Columbia and Alberta combined; those humans living and venturing across this landmass would hardly think of it as a “bridge”). But scientists aren’t sure if there was a single founding group or several, or when the migration actually happened. The remains of two human infants, found at the Upward Sun River (USR) site in the Alaskan interior, are changing what we know of this important period in human history. The researchers who conducted the genetic analysis, which involved teams from the University of Cambridge, the University of Copenhagen, and the University of Alaska Fairbanks, were fully expecting the USR DNA to match the genetic profiles of other northern Native American people—but it matched no other known ancient population, not even the two recognized branches of early indigenous peoples, known as Northern and Southern. It also didn’t match any contemporary human populations. Genetic analysis showed that these Ancient Beringians were more closely related to early Native Americans than their Asian and Eurasian ancestors. Even though the DNA extracted from the second infant wasn’t able to produce a full genome for analysis, the researchers were able to determine that the two girls belonged to the same population. The genetic analysis, combined with computer-based population modeling, allowed the researchers to conclude that a single founding ancestral indigenous American group split from East Asians around 35,000 years ago. Then, around 20,000 years ago, this group split into two groups: the ancestors of all Native Americans, and the Ancient Beringians. 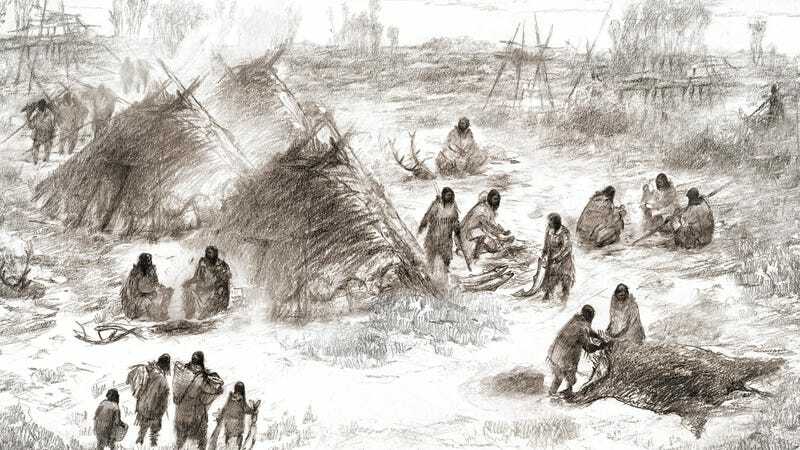 The discovery suggests two possible scenarios for the peopling of the Americas. Either two distinct groups of people crossed over Beringia prior to 15,700 years ago, or one group of people crossed over the land bridge and then split in Beringia into two groups, namely the Ancient Beringians and the Native Americans (where the latter moved south of the ice sheets 15,700 years ago). The study also reaffirms a pre-existing theory known as the “Standstill Model”—the possibility that the descendents of this single-source population were living in Beringia until about 11,500 years ago. Regardless, it now appears that the Ancient Beringians stayed in the far North for thousands of years, while the ancestors of other Native American peoples spread throughout the rest of North America. The new genetic analysis, along with previous archaeological work, also lends credence to the idea that an offshoot of these migrants, known as the Athabascans, made their way back into the northern regions of North America again, possibly around 6,000 years ago (a process known as back migration), eventually absorbing or replacing the Ancient Beringians. More research will be required to bear this theory out. Haynes, who isn’t affiliated with the new study, says it’s important to keep in mind that the paper’s conclusions are based heavily on genetic analysis and that the authors weren’t able to provide empirical support in the form of archaeological evidence with firm dates. “The suggested dating of population movements and genetic divergences in the paper relies on estimates of genetic rates of change, with tacit support from paleogeographic data (the existence of ice sheets at certain times, for example, blocking human movement), and the implication that archeological claims are correct about human presence [more than 15,000 years ago] in the Americas south of Beringia,” he said. David Lambert, a professor at Griffith University’s Australian Research Centre for Human Evolution, says the study was “carefully conducted, and employed generally well understood laboratory... methods,” and that the research was of “a very high standard.” Lambert, who wasn’t involved in the new study, says the authors presented strong genomic evidence for a previously unknown but distinct early North American population. Lambert is particularly stoked about the way ancient DNA is able to produce new and unexpected findings. “This study shows that even a single ancient genome sequenced to a good coverage can potentially make major contributions to our understanding of ancient complex histories,” he said. Indeed, this study is dependent on a single—albeit really good—sample of DNA. It’s possible the infant could be some kind of a genetic outlier (an unlikely scenario given the similarities observed between the two USR infants). More genetic evidence of these Ancient Beringians, along with more archaeological evidence, will be required to affirm these findings and push this research forward. But it’s an exciting result nonetheless—one that paints more a more complex picture of how North America was settled.